If you consider yourself a dog lover, then how could you possibly say no to an adorable face that needs a home? The Washington Animal Rescue League participated in an international rescue this week, transporting the furry survivors of a deadly fire at an animal shelter in Kuwait that happened last month. The country’s only animal shelter is now no longer in existence, 40 animals perished, but 60 survived. 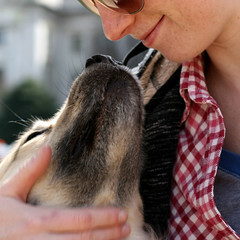 20 of those survivors our now in our fair District and need a home – that’s where you, the dog lover, come into play. Most of the dogs are mixed-breeds and are all drop-dead cuties (see photos here). Interested in adding one of these pups to your family? WARL says that some may become available for adoption as early as this weekend. For more information, you can visit the WARL website, stop by their location at 71 Oglethorpe Street, NW, or drop them a line via the telephone at (202) 726-2556.